While some people might be comfortable breaking the rules, others feel uneasy with this thought. Not everyone is happy breaking the rules, but some people might be capable of bending them just a bit in order to accomplish their goals. 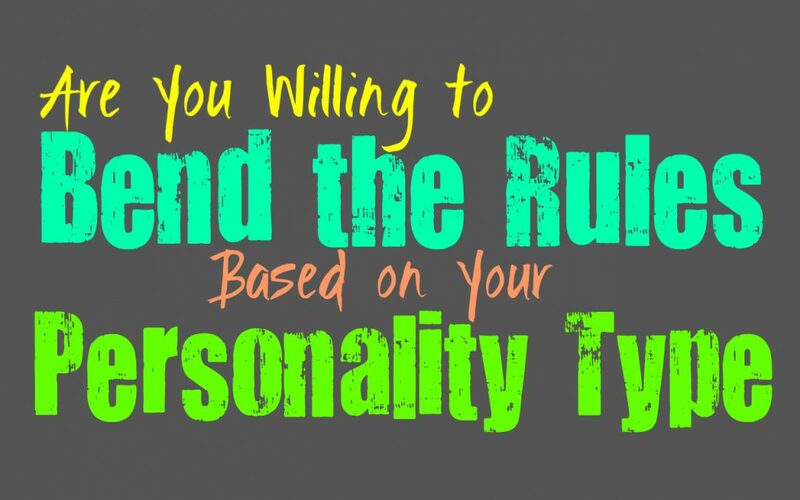 Here is how willing you are to bend the rules a bit, based on your personality type. INFJs can be seen as polite and moral people, but that doesn’t mean they are incapable of bending the rules. INFJs see most things in a bit of a grey area, rather than just a clear black and white. They don’t like doing anything that feels wrong to them, but sometimes they believe in bending the rules a bit if it seems like the right choice. For them it is important to consider their loved ones, and they realize that some rules just aren’t right and should be a bent a bit, maybe even broken in the right circumstances. ENFJs definitely aren’t afraid of bending the rules, or even breaking them if need be. In most situations they try to avoid getting into trouble or breaking rules that seem to be in place for good reason. ENFJs can certainly bend the rules if it seems like the right choice to make, especially if it will help their loved ones in some way. They do whatever they can to take care of those around them and want to provide for them as best they can. For the ENFJ sometimes making the most moral decision means bending the rules in order to make things right. INFPs try to follow their own inner morals much more than following the rules of someone else. While INFPs might not intend to bend the rules, they will if it means doing the right thing. They are more focused on following their hearts and doing what they know to be good. For the INFP their inner morals guide their decisions most of the time, and so sometimes that does mean having to bend a few rules. When it seems like the rules put in place are asking them to do something that is wrong, then the INFP won’t want to follow them. ENFPs aren’t naturally rule following people, and oftentimes they prefer to bend the rules when they can get away with it. For them it is about following their own path and doing what feels right for them deep down. ENFPs have strong inner morals and they believe in following them down the path that is true and good. While they believe in doing the right thing, which can often mean bending or even breaking the rules. For ENFPs rules are often made to be broken, especially if those rules hold them back from doing what is important to them. INTJs often prefer to follow the rules, especially the ones that they deem logical and sensible. They don’t want to simply break rules just for the sake of doing it, especially if it seems like that action could get them into trouble. INTJs don’t believe in taking unnecessary risks, but that doesn’t mean they won’t bend the rules to suit them. If it is the right choice for them, the INTJ will find a way to bend the rules to get what they want and go through it unscathed. ENTJs don’t feel a need to constantly break rules, especially not ones that makes sense to them. For the ENTJ it is more about taking the time to observe a situation and figure out what choices to make. ENTJs aren’t incapable of bending the rules, especially when it seems like the most logical choice for them. They work hard to accomplish their goals and strive for efficiency in their actions. For the ENTJ sometimes taking a step back is necessary, but sometimes bending the rules to suit them is what they feel they need to do. INTPs are not naturally rule following people, since the ideas of most rules can seem a bit foolish for them. They follow what makes the most logical sense, instead of what rules are set out in front of them. INTPs are more than capable of bending the rules, especially if it seems like the most logical and intelligent thing to do. They don’t like having to follow rules that will hold them back, and so sometimes they need to find ways to bend those rules or work around them in some way. ENTPs aren’t afraid of bending the rules, or even breaking them when the situation calls for it. They are logical people, but at the same time they enjoy exploring new things and taking calculated risks. For the ENTP sometimes bending the rules is necessary in order to accomplish what matters to them. ENTPs also don’t like being restrained or told they cannot do something, and so their defiant nature can cause them to more than bend the rules, sometimes they want to break them entirely. ISTJs really aren’t rule breaking people, and so bending isn’t usually something they are fans of either. ISTJs prefer to do what is right and keep focusing on getting the job done. They value efficiency and so they work hard to accomplish their goals and get things right the first time. ISTJs do believe in taking care of their loved ones, but they often prefer to do this without having to break the rules. They are capable of bending certain rules if they must, but they try to avoid it when they can. ESTJs are not naturally rule breaking people, since they believe in structure. They strive to do what is right and work hard to get the job done. They care about taking care of their loved ones and are very focused people. ESTJs don’t believe in simply breaking rules for the fun of it, instead they want to follow what is right. They understand that rules are in place in order to make society more efficient, but when they don’t do this the ESTJ can have their doubts. In those situations they might consider bending the rules, especially if they can get away with it. ISFJs are practical people who believe in following the rules as best they can. They don’t like intentionally breaking the rules just for the fun of it. Most of the time they work hard to get things done and do what they believe is right for the sake of the people they love. ISFJs can become uneasy with rule breaking behavior, since they often feel it can get them into trouble. They want to do what is right for their loved ones, and will only seek to bend the rules if it seems like the best move for them. ESFJs aren’t usually rule breakers, but they might be okay with bending them once in a while. They care about their loved ones and do whatever they can to provide for them. They are compassionate people who seek to take care of the people in their lives and work hard to do so. They don’t like breaking rules if they can avoid it, but they will bend them if they need to in order to take care of the people in their lives. While following rules seems more comfortable for them, they prioritize the needs of the people in their lives. ISTPs are definitely capable of bending the rules, or even breaking them if they need to. For the ISTP rules are sometimes a bit unnecessary, and they aren’t afraid to bend them if they need to. They aren’t afraid of taking risks and will do whatever they feel they need to in the present moment. They can understand that some rules are in place in order to maintain a sense of structure, but they can certainly bend them if they need to. ESTPs are definitely capable of bending rules, and maybe even breaking them if need be. They don’t like being forced to follow some pointless rules, especially ones they find completely illogical. ESTPs live in the present moment and enjoy doing what feels right for them. They sometimes take risks if they believe it will provide them with what they desire, and so sometimes this means having to bend the rules the way they wish. ISFPs aren’t afraid of bending the rules a little bit, sometimes they even enjoy this. They live in the present moment and seek out the things that bring them a sense of joy or fulfillment. For the ISFP sometimes rules just aren’t sometimes they believe in following, so sometimes they need to bend or even break them. ISFPs are often good at bending rules in order to get what they want and seek out the things that mean the most to them. ESFPs are not at all afraid of bending the rules, sometimes even breaking them. They have a hard time really focusing on the rules, since they live so much in the present moment. They seek out the things that fulfill them and bring them a sense of happiness. ESFPs don’t like doing things that are boring to them, and they certainly don’t enjoy feeling restrained. Sometimes rules leave them feeling like they are being controlled, and so they feel the need to bend or break them.